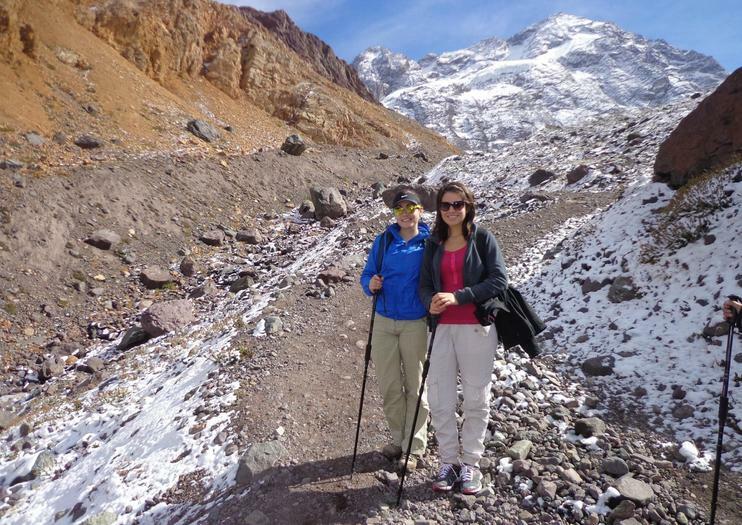 Escape Santiago city life for a day, and hike El Morado, one of Cajón de Maipo’s most popular natural monuments. A serpentine trail leads you past the ice-blue San Francisco Glacier, way up high to a lookout. If you need to catch your breath, stop for coffee and German-style sweets while taking in the views of snow-capped peaks. Trace your way along the trail in El Morado—hiking or snowshoeing through the Chilean Andes. Enjoy hassle-free round-trip transportation, and benefit from the expertise of a guide, on a full-day guided tour from Santiago. Some tours include a glacier hike. To fully immerse yourself in this region of natural beauty (and soothe sore muscles), choose a tour that follows an El Morado hike with a soak in nearby hot springs. El Morado Natural Monument is ideal for active travelers and outdoor enthusiasts. The El Morado hiking route includes several places to stop for food. The water in San Francisco Lagoon might look refreshing, but is near freezing. Dress appropriately, ideally in layers, as weather can change quickly in the mountains. Don’t forget the sunblock and sunglasses—the Chilean sun is strong and reflects off the snow. El Morado is a strenuous hike, and may be challenging for travelers with mobility issues. You can buy souvenir handicrafts in the plaza of San José del Maipo. The safest and easiest way to experience El Morado is accompanied by a guide who knows the area well, typically as part of a tour that includes round-trip transport. El Morado is accessible by public transit from the Metrobus Terminal Bellavista de la Florida in Santiago. Take a bus headed for Baños Morales. The best time to visit El Morado and Cajón de Maipo is between December and March, when the weather is milder and there’s less snow on the trail and on San Francisco Glacier. El Morado is closed between May and September. El Morado is one of the most popular full-day excursions from Santiago. Another day trip idea is a tour of local wineries, such as Undurraga Vineyard. Valparaíso, a bohemian coastal town covered in street art, is also within easy reach for Santiago-based travelers. We are going to a unique area close to the city of Santiago, named Cajon del Maipo. Plunge into steaming thermal springs and admire spectacular views of snow-capped Andean peaks on a full-day small-group tour to El Cajon de Maipo from Santiago. Accompanied by a knowledgeable guide, explore the breathtaking beauty of the Andes mountains on a moderate 5-hour hike; marvel at the jagged spires of a colossal glacier; and sooth aching muscles in the wonderfully warm waters of a thermal spring. Convenient round-trip transportation is included from Santiago. Escape the city for a thrilling outdoor adventure on this full-day trekking tour from Santiago, including hotel pick-up and lunch. Set out on a scenic 4x4 drive through the Andes mountains; admire views of Cajón del Maipo (Maipo Ravine) and Arena Valley; then embark on a 2-hour trek through the El Morado Glacier. Finish with a revitalizing soak in the Baños Colina hot springs. Embark on a thrilling 9-mile guided hike through Chile's spectacular El Morado Natural Monument National Park. Departing from Santiago, your adventure begins in the village of Baños Morales with a steep trek that flattens out as you go. Enjoy stunning natural scenery while making your way toward popular San Francisco Glacier and Morales Glacier pond. Savor a boxed lunch in the mountains, then set back out on your return trek. At the end of your day trip a vehicle will be waiting to whisk you back to your hotel. Embark on a thrilling winter hike through Chile's Cajon del Maipo, taking in the beauty of this spectacular canyon disguised in a bed of snow. Set out from Santiago for this incredible snowshoeing adventure, trekking 5-miles toward the base of a glacier, marveling at the stunning scenery—including San Jose volcano—en route. Break for an outdoor lunch, admire a waterfall that takes on new life in winter and then begin your return 5-mile hike before being dropped off at your Santiago hotel. Enjoy an active cold-weather adventure in the Andes during this full-day, small-group, snowshoeing experience from Santiago. Soak up the fresh air and test your mountaineering skills as you follow an expert guide on snowshoes through this winter wonderland of ice and snow-capped peaks. Cap off the day with some empanadas and beer to celebrate.